One of 300 microfilm editions of the King James Bible that flew to the moon on board NASA's Apollo 14 mission in February 1971. Miniature bibles that flew to the moon more than 40 years ago are now at the center of a custody dispute between the author who wrote about their history and the state caring for the reverend who was behind their creation. The two-year moon bible legal battle, which became public on Sunday (Feb. 17) through the reporting of the Houston Chronicle, began in 2010 when the Texas Department of Aging and Disability Services (DADS) intervened in a Dallas auction to prevent Oklahoma Christian author Carol Mersch from selling one of the so-called "lunar bibles" at auction. At issue was how Mersch received the bible. According to court records obtained by the Houston Chronicle, the author got the space-flown scripture from former NASA chaplain and scientist John Stout. Mersch's 2010 book, "The Apostles of Apollo," recounts Stout's founding of the Apollo Prayer League and how hundreds of the microfilmed King James Bibles were flown the moon. Stout, 91, and his wife, Mary Helen, were declared wards of the state around the same time that Mersch claims she was given the religious space relic to sell for the couple. A DADS spokesperson told the Chronicle that it was the agency's job to protect the financial assets of its wards. 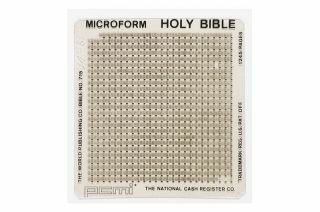 Three hundred of the approximately 1 inch by 1 inch (2.5 by 2.5 centimeter) microfilm bibles flew aboard NASA's February 1971 Apollo 14 mission, the third of six flights to land men on the moon. The small squares, each printed with the 1,245 pages and 773,746 words of the Christian holy scriptures, were not an official cargo of the space agency. Rather, they were carried by moonwalker Edgar Mitchell as a favor to Stout and the Apollo Prayer League, a group of faithful NASA employees, who, led by Stout, prayed for the safety of the astronauts. Two hundred of the bibles were kept aboard the Apollo 14 command module "Kitty Hawk," which remained in lunar orbit. The remaining 100 descended to the moon's surface with Mitchell and mission commander Alan Shepard on board the lunar module "Antares" to the Fra Mauro lunar highlands. Collectively, the bibles became known as the "First Lunar Bible." When Apollo 14 returned to Earth, Mitchell presented the bibles back to Stout, who gave some of the intact bibles and hand-cut 50-page fragments to members of the Apollo Prayer League. The remainder were kept by the Stouts. Forty years later, the Stouts were placed into guardianship after investigators deemed their living conditions to be in "deplorable condition," as the Houston Chronicle reported, citing a 2010 affidavit. The elderly couple are now living in a nursing home in Dayton, Texas. The state is seeking the return of the bibles in Mersch's custody to help support the Stouts' living expenses. Last October, a judge ruled in favor of Mersch, but Texas has since filed an appeal. Mersch has filed a counter suit in Oklahoma, claiming the bibles were gifted to her by the Stouts. Mersch told the Houston Chronicle she is acting purely out of concern for the Stouts. She said that in the course of researching her book, she had grown close to the couple. Jonathan Stout, the couple's son, said he disagrees. "The state is helping them," he told the Houston Chronicle of the involvement by DADS. "The other people are not."